Three Vietnamese tourists and a local tour guide have been killed after a roadside bomb hit a bus near the Giza pyramids in Egypt, officials say. 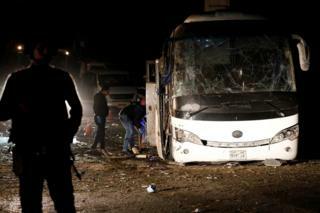 Eleven others were injured in the incident, the first affecting foreign tourists in Egypt in more than a year. Prime Minister Mostafa Madbouly said the bus had deviated from its planned route without alerting security forces, although the driver denied this. No group has yet said it was behind the blast. Islamist militants have targeted tourists in the past. Two German tourists were stabbed to death at a hotel in the popular Red Sea resort of Hurghada last year. Security is already tight in Egypt, with the tourist season at its height and the country's main Christian minority, the Copts, preparing to celebrate Orthodox Christmas on 7 January. Egypt's neighbours in the region condemned the attack and the British Ambassador to Cairo, Geoffrey Adams, said the UK stood "with Egypt in the fight against terrorism". What do we know of Friday's attack? The bomb went off at about 18:15 (16:45 GMT) on Maryoutiya Street in Giza's Haram district as the bus carrying 14 Vietnamese tourists was passing, according to official accounts. Security forces rushed to the scene in response and police are investigating. The injured were taken to the nearby Haram hospital, Reuters news agency reports. "We have been in contact with the embassy of Vietnam to contain the impact of the incident, and what is important now is to take care of the injured," Prime Minister Madbouly was quoted as saying. How has tourism fared in Egypt in recent years? Tourism is a mainstay of the economy. It peaked in 2010, when the country saw more than 14 million visitors, but fell sharply after the turmoil of the Arab Spring the following year. Worse was to come after militants bombed a Russian passenger jet in 2015 as it left Sharm el Sheikh, killing 224 people. The following year just 5.3 million tourists visited, according to the World Bank. President Abdel Fattah al-Sisi told visiting Vietnamese leaders in May that he was keen to revive Vietnamese tourism in his country, according to Egypt Today.